A sustainable society is possible. The social contract between business and society needs to be re-negotiated. Business success is inextricably linked to a thriving society, building trust and relationships with government and other key stakeholders. Collective action between business, government and civil society will support large scale system change in a sustainable way. The role of business as a key enabler shaping and achieving a sustainable future. 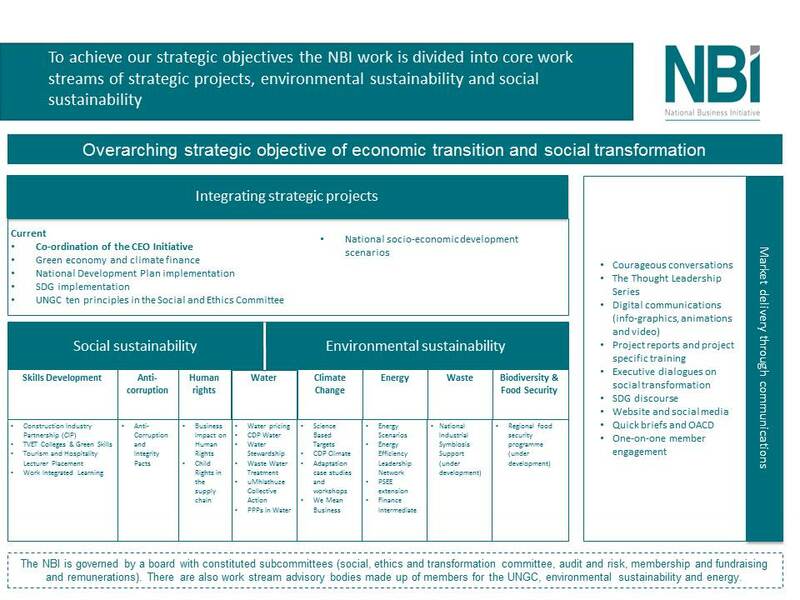 The NBI’s strategy to drive business participation in an economic transition and social transformation. Strategic thought leadership that uncovers areas of shared risk and opportunity. These opportunities and risks form the basis for designing collective action programmes and understanding implementation approaches. Building the capacity of all stakeholders, with a focus on business, to engage in potential collective action programmes. We emphasise building parity in knowledge, understanding and capacity across partners, enhancing the potential success of collective projects. Designing and implementing collective actions that lead to business-led solutions that unlock developmental outcomes and drive sustainable growth. These actions also facilitate business engaging in courageous conversations with multiple stakeholders. Our work streams are strongly influenced by the local and international guidance provided by the National Development Plan (NDP) and the Sustainable Development Goals (SDGs). The work streams have a suite of projects across our three ways of working (i.e. thought leadership, capacity building and collective action programmes/projects) that align to deliver the NBI’s strategic objectives.